Hi, everyone! Thanks for all your warm wishes– Man Friend is back in good health! To celebrate that, and our 6th anniversary (tomorrow), I stitched him up a fancy new pair of PJ’s! 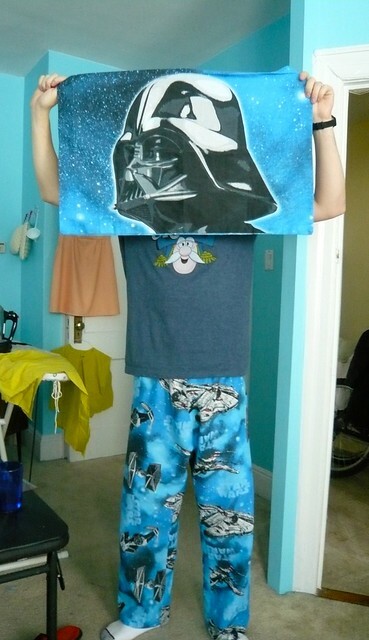 He’s quite the Star Wars fan, so I used a sheet set. The fabric is really weird, some kind of strange, stiff poly-cotton blend, so maybe not the nicest for pajamas, but he loves the print, so I guess that’s OK. Maybe they’ll get a little softer after washing them a few times. Look at puggy adoring his pop! As you can see, I made no attempt to match the print. I probably should have positioned it a bit more strategically– it looks a bit sloppy. Oh, well! I also didn’t use a pattern– I planned to trace a pair of Man Friend’s pajamas, but I couldn’t find or he doesn’t own any actual pajama pants (just track pants or sweats… so fashionable…), so I traced a pair of sweatpants. The sweats are a bit too big for him, I guess, cause these turned out a little large. Bad news– Cap’n Crunch has defected to the Dark Side! Man Friend requested that I not show his face to “cultivate an air of mystery” about him. Hahaha! Don’t you just want to know more about this mysterious, pajama-ed stranger?? Hope your weekends are going swimmingly! I’m looking forward to jumping back into MMM tomorrow! 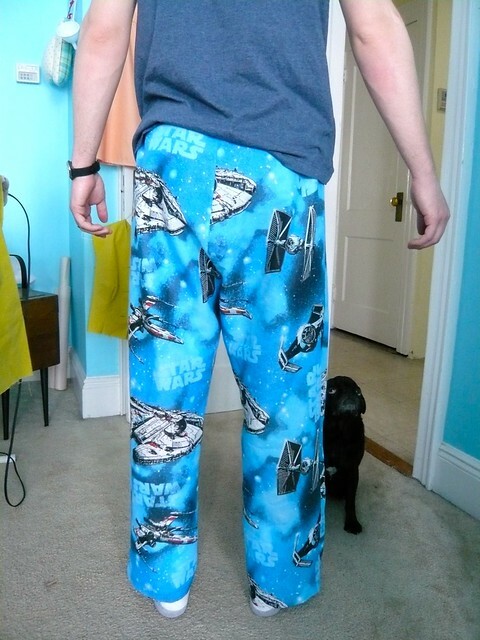 Oh wow, these are cool, my husband would love some PJs like this! I love your pug’s face too, what a cutie. Thanks, Kerry! These were really fast to make, especially since you don’t even need a pattern. Make some for your husband! I dunno . . . Doug looks a little dubious about the new PJs. But I think they’re really cool! Hahahahaha! You’re right– Dougie has probably never seen such tacky PJ’s before! Ha ha – instead of where’s Wally it’s like where’s Puggy in your pictures! A great set of PJ’s ! Aww, he needs a little red and white cap! Hahahaha! I know just what you mean! cute pressie, plus pj’s are meant to be a little large! Thanks, lady! That’s a good point– it’s so easy to get wound up about fit issues that aren’t really issues. These are so cool! Haha. I bet my husband would like something like this! Do it! I bet he would love having something you made for him! Hahahaha! I don’t dare show my mister the western shirt you made for Mr. Dapper Duds! He’d want one right away and I have no idea how to handle something that complicated! That would be amazing! A Star Wars PJ party! They’re brilliant! Thankfully my hubby doesn’t wear PJs but then I’ve never offered to replace the tracks he wears instead… And I wanna know what you’re making! I love the colour of the fabric on your ironing board! Ooh, good eye! I dug out my oldest UFO– working on lining the skirt right now and then I need to figure out how to do a kick pleat! Love those pants! My hubby would die for a pair like that. 🙂 Btw, my mom always called our dates “man-type friends of the male persuasion”, so I love that you call your BF man friend! Enjoying your blog! Hahaha, that’s funny! Thanks for stopping by! I’m hopping over to check out your blog right now! Make sure you say it with a slightly judgmental Wisconsin accent! Adds to the charm, doncha know! 🙂 Thanks for stopping by my blog! Do you have any brothers? I looooooooove to make or buy hilarious (read: embarrassing) stuff for my younger brothers. They always act all annoyed but will wear anything I get them… mwahahaha! He hee. Unfortunately (or fortunately? lol) I only have sisters. Hahaha, well, I hope you have some brother-in-laws someday that you can torture (I have three now!)! It’s really, really fun! Bahahahaha! Sometimes I think Doug looks a little like Darth Vader… which is weird, because he also looks like Yoda! He’s a complicated dog. Happy Anniversary! How cute. 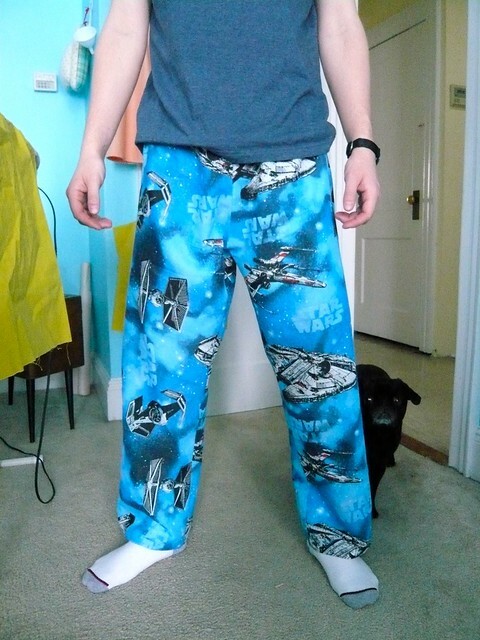 My hubby also loves Star Wars – he would probs love some themed jammie pants. STAR WARS!!!! Love it so very much. Happy Anniversary, my dear!